Ok, I finished the last bit, and decided to take a couple more pics after washing it and before sending it off. After shrinking less than an inch, it’s 46 inches total–40 inches to the point where it splits into 2 separate parts for the first half of the “tail.” A little over 1/2 inch in width. The loops had been about 77″ before braiding, but I ended up cutting off almost 12 inches of unused loop below the knots after I was done. So I could have gotten away with a 68″ warp, allowing for a few inches of finger-ease at the end of the loops. I took a picture of the ending braidlets because the upper part clearly shows the two halves (L and R) of the braid that the 2 workers (or for me, my left and right hands**) would be braiding. The lowest green section—where the two halves join up again—is where the 2 braiders would again be exchanging their adjacent index-finger loops after each cycle to link their 2 braids into one. With my single-braider method, it’s the uppermost d-finger loop on each hand that gets exchanged. This is the reverse side, to show the opposite color configuration on the other side of the double-weave. If you click on the images to enlarge them, you’ll see the threads coming through where the two colors switch surfaces. It’s the same thing as when you braid a 5 or 7-loop square braid, but without turning (crossing/ reversing) any of the loops when taking them. You get a divided double-weave braid. If you are using bicolor loops, when you turn over the bicolor loops on your fingers so the green shanks are on top, the green comes to the top surface of the braid (and links the two surfaces together at that point). This is essentially how the letters get formed as well. They are in reverse colors on the other side of the braid. Of course they “read” backward there, so there’s only one good side to the braid. Update: Instructions [now with video] for the braiding method for the very interesting 7-loop braid that is the basis of this letterbraid are here. 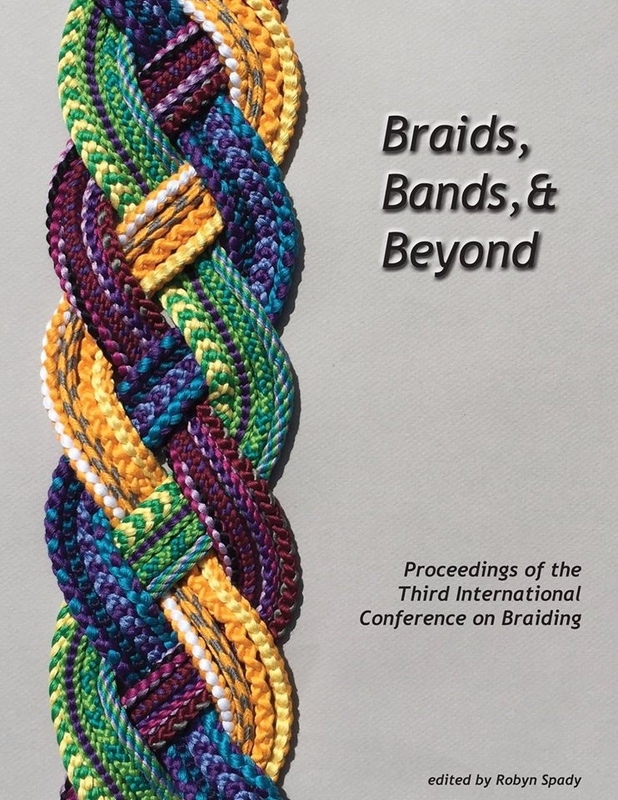 To make a letterbraid you would also need a braiding partner, and Joy Boutrup’s publication* in order to follow the charts for the individual letters. That post also has a text description of how I hold all 14 loops to braid it solo. I later posted a video tutorial for my solo method for braiding a different letterbraid – the 10-loop Nun’s Book letterbraid. **Actually, where the braid splits like this into two parts, I put one hand’s loops down on a holder and braid the two separate halves separately–then I pick up and hold all the loops together again for braiding the joined part.